The Chad Valley Company was one of the most successful and best-loved of all English soft toy manufacturers and although it ceased trading in 1978, the memory of its golden years lives on. 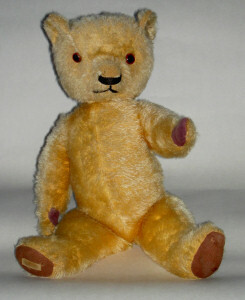 Today, Chad Valley teddies and other animals are highly popular with collectors for a variety of reasons. For a start, they were well-designed and generally made of good quality materials, and in the firm’s heyday its inventive designers came up with one appealing product after another. Then there is the identity factor – Chads are often easy to identify, even without their original labels – making them particularly attractive to novice collectors. Finally, price is a key factor in the collectable status of Chad Valley bears. With a few exceptions, they rarely cost more than a few hundred pounds because there are still quite a lot of them available in good condition, and are therefore accessible to collectors with limited budgets. 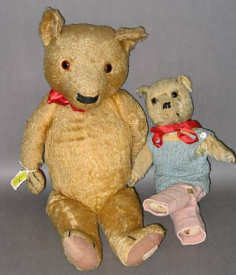 Pictured left: Chad Valley Magna Teddy bear, English 1930’s Golden mohair bear with orange glass eyes, stitched nose, mouth and claws, swivel head and jointed at shoulders and hips, cloth paw pads, red ribbon to neck, label to right foot, 48cm (19in) tall – sold at Bonhams, Nov 2006 £120 – image copyright Bonhams. In 1953, following the death of King George VI and the accession of Queen Elizabeth II, the wording changed to read ‘By Appointment Toy Makers to H.M. Queen Elizabeth The Queen Mother.’ (If original labels are present today, this enables the modern collector to date Chads of this period to within a few years). During this period of growth and development, one of the most distinctive of all Chad Valley teddies was produced. Known as the Magna bear, it was launched around 1930 and featured an unshaved muzzle, smallish, widely spaced ears and a narrow, horizontally-stitched oblong nose. It is this instantly recognisable nose that allows aficionados to unhesitatingly pick out a Magna from a room full of similar bears. The slightly serious, perhaps even grumpy expression common to Magnas has made them well-liked by collectors although they were not terribly popular in their own day. This could be because their admirers of today are adult collectors who appreciate any teddy idiosyncrasies, whereas in their early days Magnas were intended to be played with by children who are more inclined to appreciate a friendly rather than an austere expression. In any case, UK production of teddy bears was severely curtailed during WWII and its immediate aftermath, and when it resumed in the 1950s styles and tastes had changed dramatically, leaving no demand for the old-fashioned Magna. In its own way, this characterful English bear is as much an evocation of the 1930s as a Clarice Cliff tea set and should be revered as such.